If you decide to stay at a hotel or resort close to Lagonisi Beach, you’ll have the benefit of walking to the beach at your leisure. Multiple times a day, if you so choose! If you’re staying in Athens or a nearby town, you can drive if you’ve rented a car or you can hire a taxi. If you drive yourself, there is parking available at the beach. Driving yourself also gives you an opportunity to stop along the way for photo opportunities or to make any stops you want. There are also public transportation options. You can ask someone at your accommodations for directions and bus information, which will make getting there easier. Lagonisi Beach is located in Sithonia, Greece. 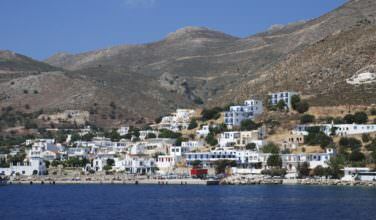 Sithonia (also known as Longos) has played a large role in Greek history and mythology. While predominantly Greek, influences in Sithonia also come from the Thracians, the Persians, and the Romans to name a few. At Lagonisi Beach there are wooden paths to make your walk down the beach easy before you settle into a nice sandy spot of your choosing. 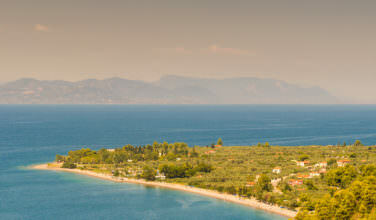 Lagonisi Beach is an organized beach with plenty of facilities for its guests, such as bathrooms. You can also rent sun beds and umbrellas or bring your own. The beach also features lovely changing rooms and showers for your convenience. There is an entrance fee of 5 Euros per person. Weekends tend to be busier, so if you can visit during the week, you can enjoy a less crowded environment. The beach has become quite popular with both locals and tourists. The scenic bay and sparkling light blue water make it an appealing place to spend the day relaxing, sunbathing, and swimming in the shallow water. While you’re in the area, you might choose to enjoy a luxury sport cruise, a yacht cruise, or a boat tour of the area. You can also enjoy water sports, such as kayaking and snorkeling, while there. 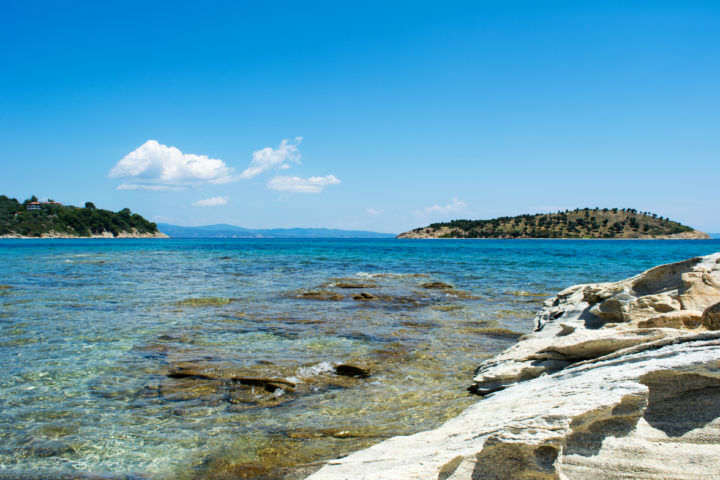 There are many places to eat around Sithonia including tavernas, seafood restaurants, pizza places, and fine dining if you want to end your day on a romantic note. There is also a beach bar on site, so you won’t have to look far for refreshments while you’re hanging out on the beach. You might prefer to pack your own picnic lunch to enjoy at the beach. 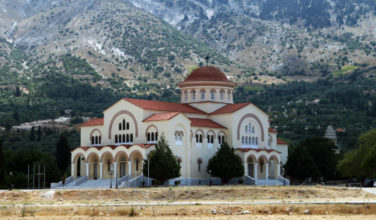 Nearby in Ormos Panagias you will find both mini markets and restaurants. Less than 4km away you will find Vourvourou Bay, which is also a family friendly area. Lagonisi Beach is a spot well worth the trip when you’re visiting Athens. Enjoy a gorgeous view, calm water, soft sand, and good company while you relax in the sun or shade.